who fell in the two world wars of the 20th century. Please help us remember those who died for us. Welcome to Dover's Virtual Memorial. The Dover War Memorial Project is run entirely by volunteers. 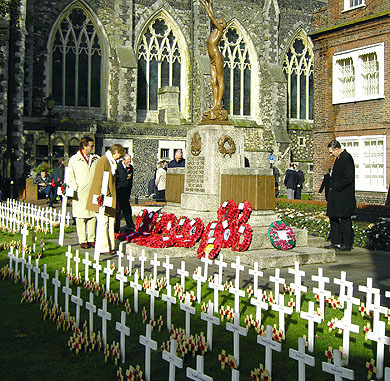 The Project began on Remembrance Sunday, 2005, to honour all those we lost from our front-line town, Dover; the Gateway to England. Much information on the casualties of war is freely available in public records or the internet - this site is different. This site introduces the people we so sadly lost, not only in records but as remembered by those who knew them. The Virtual Memorial is made with love, dedicated to those who gave their lives and to the relatives they left behind. In the past, the present, and for the future, through many different initiatives and programmes, The Dover War Memorial Project preserves the memory of our Fallen, that it may remain forever green. We are greatly privileged to work on the Project, to meet so many kind and courageous people, and to learn so much of the dedication and sacrifice of those who died. Dover can never replace them, and our world is much the poorer. Welcome, then, as you meet those who never came home. As you join us, please remember in your thoughts and prayers those who gave and those who continue to give so much. And trust those things we won to you to keep. The George Cross for Dover! 2010 was the 90th anniversary of the return of the Unknown Warrior. The Heritage Lottery Fund approved a grant enabling young people in Dover, Chatham, and London to learn about his significance through the stories of six casualties of the Great War. Updates on "Latest News" and report in "From the Front" issue 4.